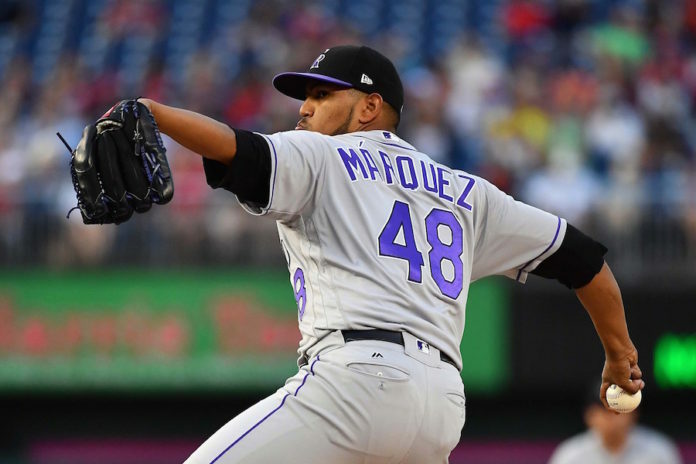 Colorado Rockies (58-50, third place in NL West, 5-5 in their last 10 games) vs. Milwaukee Brewers (63-49, second place in NL Central, 6-4 in their last 10 games). Marquez (7.2 IP, 5 H, 2 ER, 8 K) was dominant and earned the win in his last start against the Athletics. The Venezuela native has won four out of his last five starts and has failed to lose an outing since June 24. Marquez is tied for first on the club in wins (9) and is second in strikeouts (120). Guerra (4.0 IP, 5 H, 5 ER, 5 K) took the loss in his last start against the Giants. Guerra has allowed at least five earned runs in two out of his last three starts but still holds a respectable 3.43 ERA. Peralta (4.0 IP, 3 H, 1 ER, 6 K) was also left with a no-decision in his last start against the Dodgers. He is currently tied for third in wins by rookie pitchers in the NL (4) and is facing a Rockies’ team that he dominated on May 13 (5.2 IP, 1 H, 0 ER, 13 K). Gray (7.1 IP, 4 H, 2 ER, 5 K) was superb and earned the win in his last start against the Cardinals. 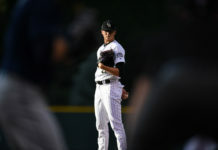 Gray, from Oklahoma originally, currently leads the Rockies in strikeouts (136) and is tied for first in wins with Marquez (9). Gray has gone at least seven innings in all three of his starts since being recalled from Triple-A and has not lost an outing since June 12. Miley (7.0 IP, 2 H, 0 ER, 5 K) was dominant and earned the win in his last start against the Dodgers. Miley’s outstanding 1.53 ERA has been an impressive climb from last years 5.61 ERA. The Hammond, Louisiana native is an all-time 7-2 against Colorado with a 3.79 ERA. Carlos Gonzalez has continued to stay hot (28-80, 18 RBI, 6 HR) and currently is enjoying a respectable line of a .289 BA, 13 HR, and 47 RBI. Gerardo Parra has played well for the Rockies recently (8-21, 3 RBI) and has been a solid platoon player in 2018 (.294 BA, 5 HR, 45 RBI). 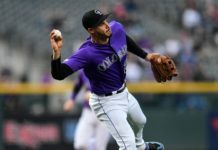 Nolan Arenado continued to stay hot in St. Louis (6-18, 5 RBI, 1 HR) and has been incredible at the plate for the Rockies in 2018 (.308 BA, 28 HR, 80 RBI) and has emerged as a front-runner candidate for NL MVP. Arenado currently leads the NL in home runs (28) and is third in RBI (80). Christian Yelich (28-59, 5 HR, 15 RBI) has been a monster lately at the plate for Milwaukee and has been the catalyst of the Brewers’ offense in 2018 (.321 BA, 16 HR, 58 RBI). Lorenzo Cain has continued to play well for the Brewers in 2018 (.299 BA, 8 HR, 30 RBI) and has been hot lately, going 10-26. Jonathan Schoop has been on fire (35-104, 9 HR, 19 RBI) and was recently acquired from the Baltimore Orioles. Schoop recently held a 12-game hitting streak before he was dealt to the Brewers. Chris Iannetta is just 3-32 lately and has had a rough go of things for the Rockies this year, hitting .219 BA, 7 HR, 22 RBI. Tony Wolters (1-7, 1 RBI) has struggled mightily for Colorado this year and has not been able to find his groove at the plate in 2018 (.159 BA, 2 HR, 18 RBI). Tom Murphy is just batting .247 since being called up to the big leagues this year and has failed to contribute much offensively for the Rockies this year (.247 BA, 2 HR, 11 RBI). Notice a trend? They’re all catchers. Eric Thames has been ice-cold for the Brewers (6-29) and has had a mediocre year in 2018 (.243 BA, 14 HR, 32 RBI). Ryan Braun is just 9-34 at the plate lately and the former NL MVP has been unable to do much from the batter’s box for Milwaukee in 2018 (.239 BA, 11 HR, 40 RBI). Jesus Aguilar (7-44) has struggled recently for the Brewers but has had a phenomenal season (.278 BA, 26 HR, 77 RBI) and was rewarded for it by being named to his first career All-Star game earlier in the year.